Unstable turbulent ows are widely encountered in engineering applications generally leading to perfomance reductions. We aim at characterising numerically the unstable dynamics of a turbulent ow using linear stability analysis in a global framework. The turbulent ow eld is computed using the Reynolds Average Navier-Stokes equations so that we focus on the unsteady dynamics of turbulent large scale structures. We thus investigate ows where scale decoupling holds and we will detail here the case of an open deep cavity ow 1 . The impact of the small scales on the dynamics is modelled using the tubulence model k ! of Wilcox2 . The system of equations, including the turbulence model, is linearised to get an eigenvalue problem. Unstable modes corresponding to the dynamics of the large structures of the turbulent ow are extracted. Finally, in view of open loop control, the sensitivity gradients of the unstable eigenvalues with respect to base ow modi cations are computed and give insight of interesting zones where steady perturbations could stabilize the ow3 . All the numerical computations are done using a nite volume code based on the Roe scheme. 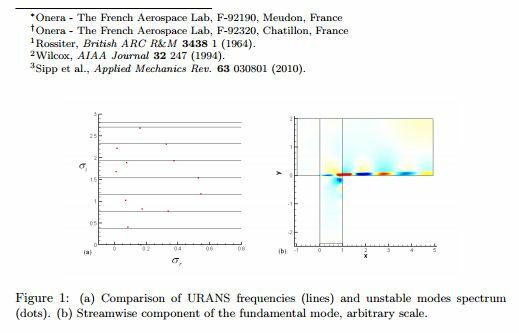 URANS simulations reproduce the unsteady behavior of the ow as the obtained spectrum displays strong peaks in good agreement with experimental results. Unstable global modes are then extracted with frequencies in accordance with the observed unsteadiness as can be seen in Fig 1(a) . Features of the Kelvin-Helmoltz instabilities are observed in the structure of the unstable modes, the fundamental mode is depicted in Fig 1(b) as an example. Sensitivity elds to base ow modi cations are compared with an experimentally obtained control map where the ow was manipulated using a small cylinder.